8 Best Green Hotels for Your Honeymoon - Your No.1 source of Architecture and Interior design news!
. Published on March 29, 2019 . Once in the hotel Adrere Amellal, you go back to the past when the candles replaced the electric lighting, and the cold nights of the desert replaced the air conditioners. Located in the Siwa Oasis, Adrere Amellal was built entirely by hand, using a mixture of stone, salt water, and clay. Except for modern bathrooms and beds, it seems that the place has not changed for thousands of years. Immerse yourself in ancient times, eating fruits and vegetables and waking up at sunrise. 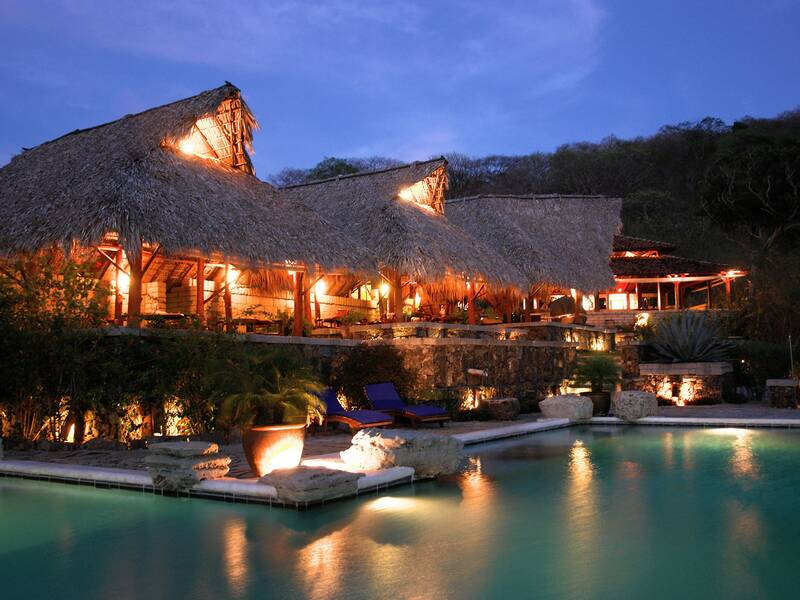 The Six Senses Hotel cares for its guests and the environment. It gives part of the money from the sale of its mineral water to build a source of drinking water for a local school. It also buys products from local vendors and works with suppliers who share their views. The hotel itself is built in the way that it’s as open as possible, reducing the need for air conditioning. Here, you can take bicycles for sightseeing and play golf without fear that the ball will fall into the ocean because in water it decomposes in 48 hours, releasing food for fish. Finally, swimming pools, crystalline waters, and a secluded atmosphere will help you to spend an unforgettable time together. Located in Torres del Paine National Park, the Tierra Patagonia Hotel is an ecological paradise for nature lovers. The soft, curved lines of architecture blend perfectly with the jagged peaks of the mountains which are visible from each window of the hotel. The entire hotel and most of the furniture in it are made entirely of local wood, and for every guest, they plant a tree, contributing to the restoration of forest areas after a forest fire in 2012. Almost 1400 meters above sea level, at the foot of the Alps, is located the Whitepod hotel consisting of 15 igloos that leave the landscape untouched. This hotel resort focuses on low energy and water consumption, using renewable sources and telling guests about the importance of caring for the environment. The spacious igloo is equipped with a wood-burning stove and plenty of natural light. Also, a few steps away you can find a place for needle massage, a Finnish sauna, and a Japanese bath. In winter, the hotel offers skiing or dog sledding, hiking, and paragliding. In summer, the hotel becomes a summer camp for tourists. Despite its location, it’s quite luxurious. 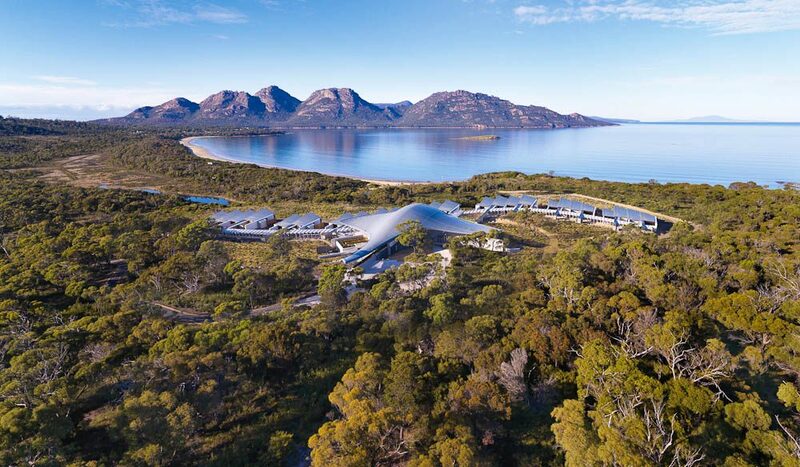 Stylish, surrounded by beautiful Tasmanian nature, the Saffire Freycinet offers you an incredible view from every window. More than 30,000 trees were planted by the resort to restore the once astonishing landscape. The building itself was designed by a Tasmanian architect, and the interior was made up of locally made furniture. One of the best (and most extravagant) ways to return to nature includes dishes from freshly caught oysters and local white wine which is fantastic. 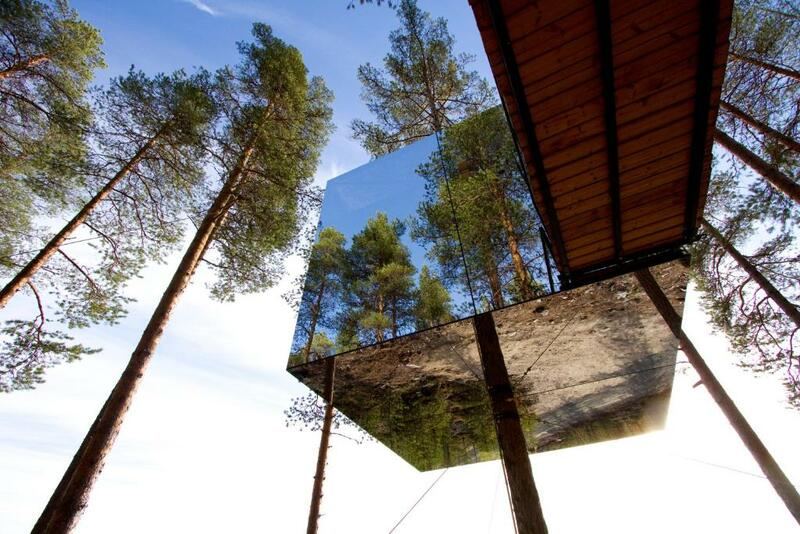 Right in the middle of the Swedish forest is the Treehotel which has only five rooms or, more specifically, tree houses. Treehotel has made great efforts to integrate these rooms into the trees without disturbing the environment. Wooden floors do not contain any chemicals, and each house is equipped with underfloor heating and LED lighting. Perhaps the Treehotel would be an excellent choice for those who love nature and unusual architecture. This hotel is an attraction for tourists from all around the world. Six custom-made tent houses define the mystique and elegance of this marvelous place. Also, every piece of this hotel is made with sustainable materials, from wood to all of the furniture involved. San Camp is one of the “greenest” hotels because when the dry seasons end, it is removed, and the place looks as if there was no hotel in the first place. Located on 4,000 acres of jungle, Morgan’s Rock Hotel belongs to a private owner. Here, you can see the permanent inhabitants – sea turtles, howler monkeys, and sloths, and relax on a private mile-long beach. It’s perfect for those who prefer more active rest. Because in the morning, you can work a little on the farm and enjoy the fruits of your labor in the afternoon. You should visit this place with a person you love, but if you don’t have one just yet, visit this site with lots of women waiting just for you.